The week before Thanksgiving Break, Wesleyan’s African Student Association (ASA) held a series of events for Africa Week 2018 including a film screening, a Late Night food sale at Ubuntu House, the Second Annual Indaba Conference, and the popular Ariya cultural showcase. Kicking off the series of events was a screening of the film “I am Not a Witch” from Zambian-Welsh director Rungano Nyoni on Tuesday, Nov. 13. On Thursday night, a Late Night food sale was held at Ubuntu House on Lawn Avenue featuring home-cooked cuisine from all over the African continent. This year’s Ariya was another success, held Saturday night in Crowell Concert Hall. The event featured a showcase of dance, music, spoken-word poetry, and fashion. The Argus spoke to Ferdinand Quayson ’20, head of Public Relations for the ASA. Quayson is the accomplished founder of Young Achievers Foundation in Ghana, which he started in 2016 to aid Northern Ghanaians in getting access to higher education. When asked about the planning process for this year’s Africa Week, Quayson shared that the ASA recognized the popularity of the Ariya showcase and wanted to hold an entire week to celebrate African culture. He sees Africa Week as the perfect way for the ASA to make itself known to the Wesleyan community, allowing members to share their cultures and backgrounds. The most informative event of the week was the ASA’s second annual Indaba Conference held at Russell House on Saturday morning. Quayson described how they selected the panelists in line with the theme of this year’s event: African changemakers. The conference consisted of three panels: Africans in STEM, African Women Change Makers, and Social Entrepreneurship and Social Activism in Africa. Africans in STEM featured speakers Stacy Uchendu ’17, an alumna currently doing biochemistry research at Yale, and Ariana Pather, a South Africa native working towards her masters of public health at Brown and conducting research on HIV in her home country. The pair discussed the varied and rich experience of Africans in STEM fields but broadened their conversation to the future, particularly STEM developments in Africa and the advancement of Africans working in STEM fields. Pather explained the value of having African natives doing research that directly affects the continent. The African Women Change Makers panel featured the following panelists: Catherine Labiran, a master’s student of African Studies at Yale, published poet, and human rights advocate; artist bay b. Bop, a Zimbabwean-South-African Columbia student and founder of Thou Shalt Not Art Collective; and Faith Chumo, an activist, current Yale student, and vice president of Yale’s African Student Association. The women passionately discussed their fields of activism in Africa, as well as the controversies and nuances of volunteerism in Africa. They also emphasized the power that sisterhood and mentorship can give to ambitious young women of color. bay b. Bop offered a powerful statement on growing female African leadership. The Social Entrepreneurship and Social Activism in Africa panel featured Toto Kisaku, a successful Congolese playwright who examines the use of artistic activities in impoverished and oppressed African communities; Quayson, whose previously mentioned Young Achievers Foundation has been educating Ghanian high school seniors on scholarship opportunities and higher education possibilities; and Ibrahima Amadou Niang, a Yale Greenberg World Fellow from Senegal, head of the Open Society Initiative for West Africa Guinea country office, and a creative activist. 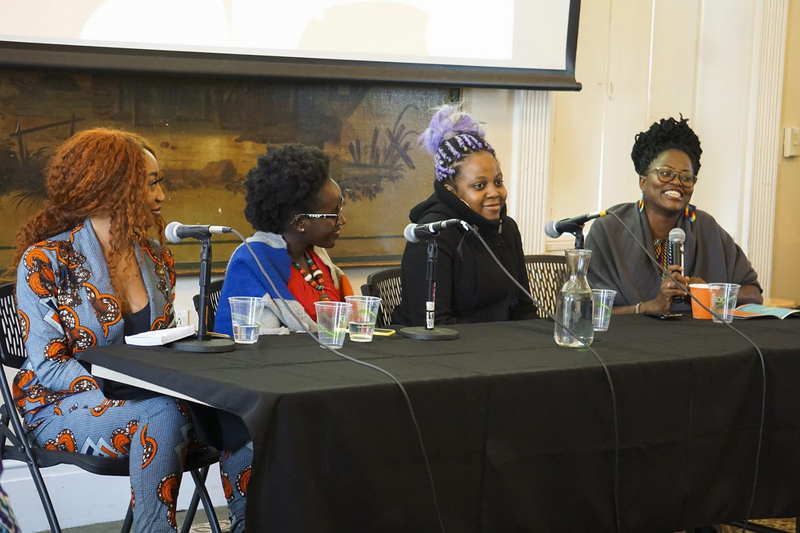 All founders of their own social initiatives in Africa, panelists discussed the work required to practice productive activism in the current political and social climates on the continent. Meredith Olin can be reached at molin@wesleyan.edu.